Do you ever feel frustrated or irritated with others? It could be with a family member, or a neighbour, the boss or perhaps a work colleague? Do you ever find yourself disagreeing with others, or feeling disappointed? Have you ever been misunderstood and wonder why? And do you ever find that others just do not seem to hear what you're saying? 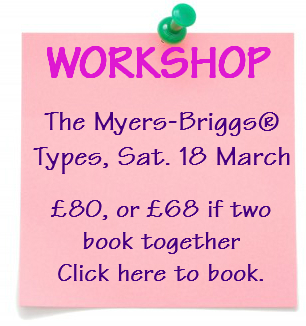 If you hear yourself answering 'yes' to these questions then why not come along to this fun one-day MBTI® workshop? 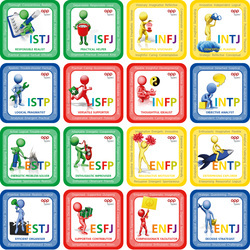 The workshop introduces you to the 16 Personality Types® together with the different strategies used by each Type for decision making, thinking, managing time and the differences in Type behaviour. And you can use these insights in your everyday relationships, whether you're parenting, working, loving or simply communicating with friends, colleagues and family. Click on post-it to book your place. £80 each day or for Multiple Bookings: There is a further 15% discount for bookings of two or more. ... performance enhancement, goal achievement, relationships, motivation, confidence, creativity, life/work balance, exam nerves, stress, conflict, phobias, weight loss, allergies, quitting unwanted habits and much more .. including letting go of negative feelings to feel calmer, happier and more content. 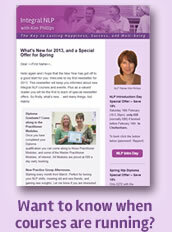 Contact Kim for further information on how NLP can help you personally and professionally.